This really was bound to happen, the days when we’d all think of our dream cars as ‘brand new’ have all but passed a couple decades ago. While the 90’s still seem to be like yesterday to most of us, it appears we’ve all grown up. Growing up isn’t all that bad though, because that means our generation now has the means to attain those cars we used to cut out from magazines, buy as toys, or play on Gran Turismo. 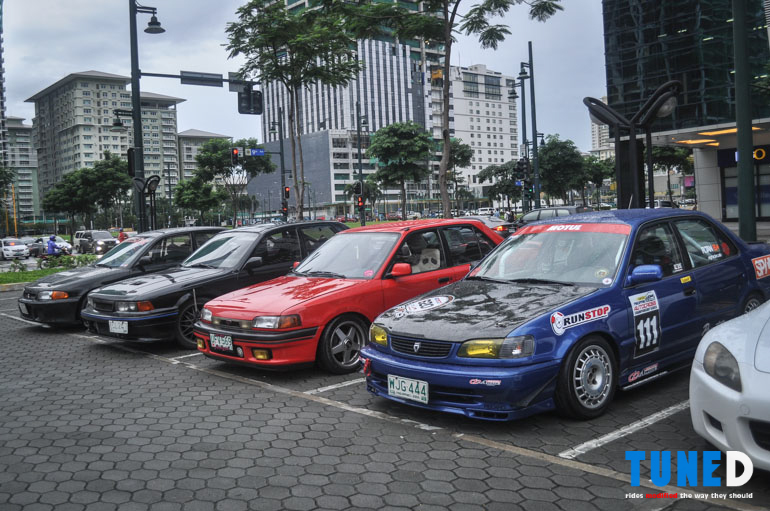 After a random conversation with friends on Facebook about the good old days, a realization that we all drive cars from the 90’s, and a bunch of invites sent for the planned meet, it appeared we’ve gathered a bunch of like-minded people that miss the 90’s too! 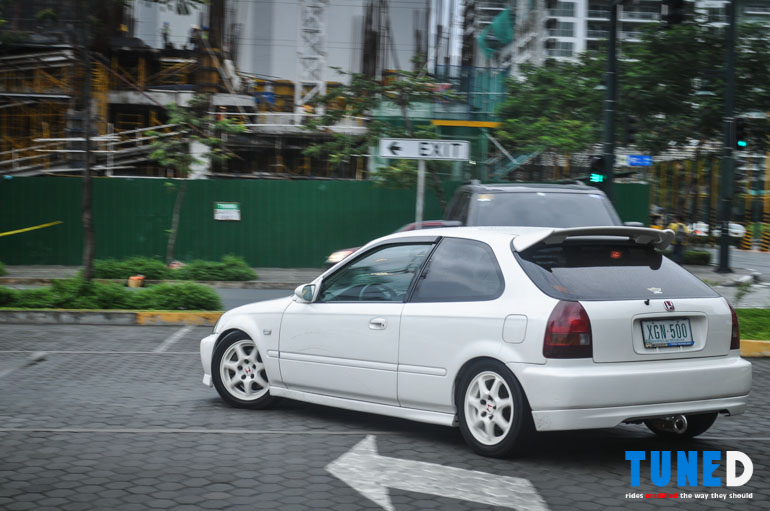 We found ourselves at the Crossroads carpark in BGC on a rainy Saturday afternoon with nary but a few cars in sight. 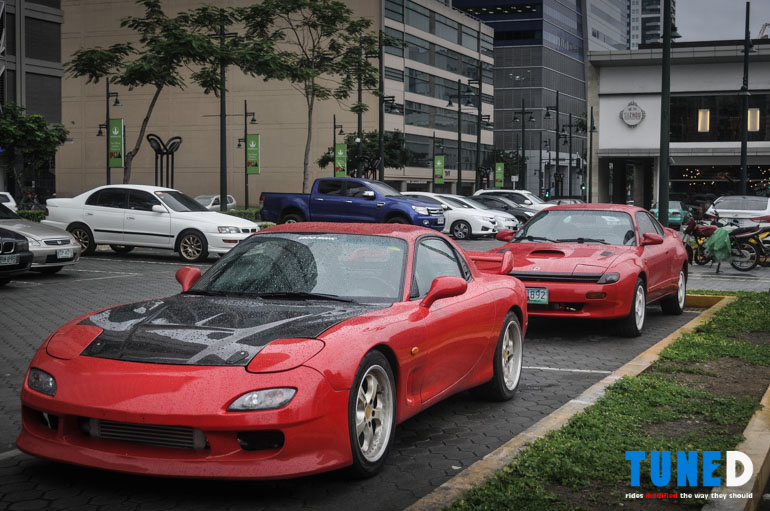 Of course, my RX-7 FD would have to be present for an event such as this. 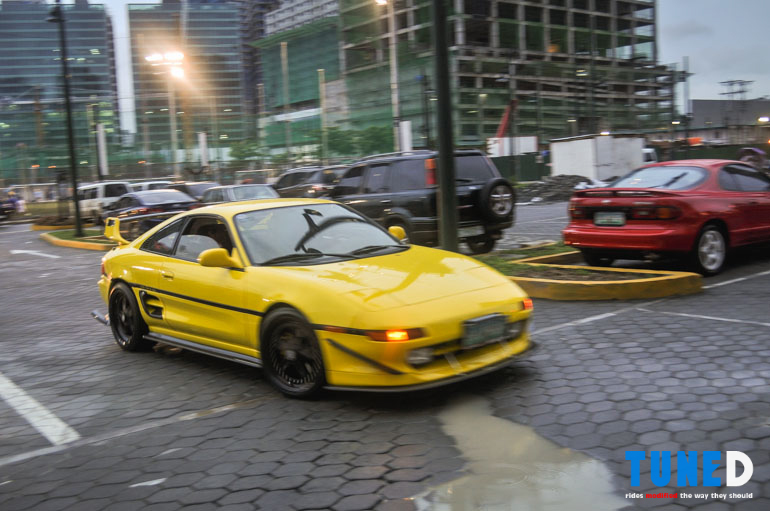 With only a handful of rotaries prowling manila streets, I’d have to be the one to carry the pistonless flag for the day! 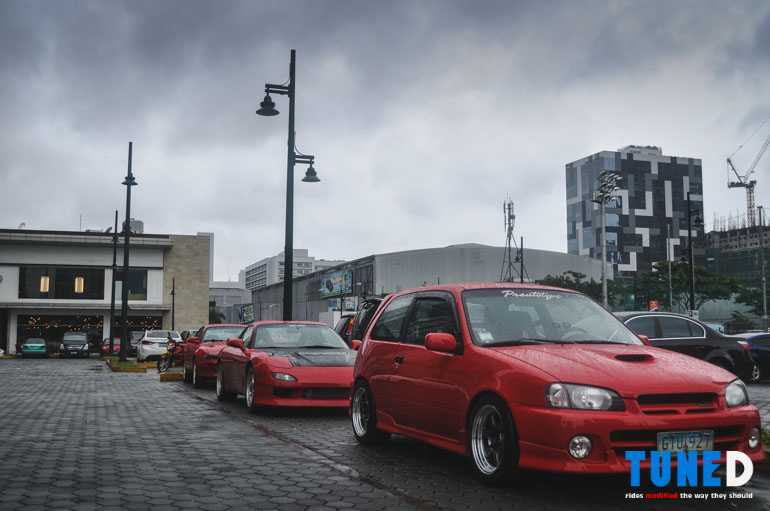 I squeezed in between this pair of Toyotas to form a single file of red in the middle of the lot. 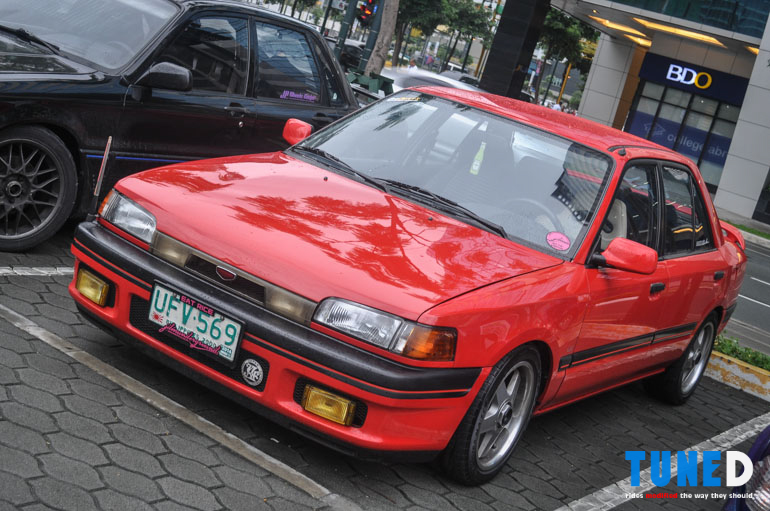 You may have seen this EP91 Starlet before, and the ST185 Celica at the rear is a clean example of a car that hardly anyone noticed even a decade ago. Yet now that it’s difficult to find, I’ve been hearing some friends ponder about getting one themselves! Safe to say that most 90’s Toyotas have aged quite well then. With the rain being intermittently strong, it was getting difficult to grab good photos. 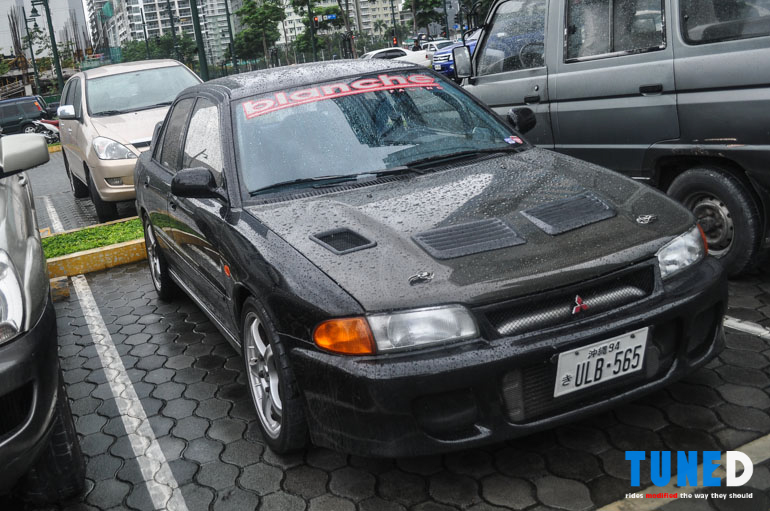 Thankfully I was able to grab a photo of this Lancer Evo I (Yes, uno, one, 1.) before the rain got any stronger. 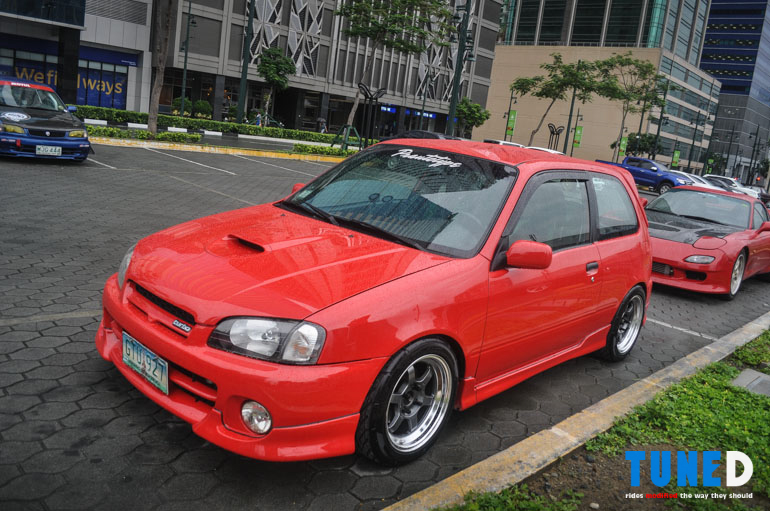 Seeing a car like this would easily remind us of the Evo’s humble beginnings as a Lancer, much unlike its big-winged, big-dish-foglamped successors. 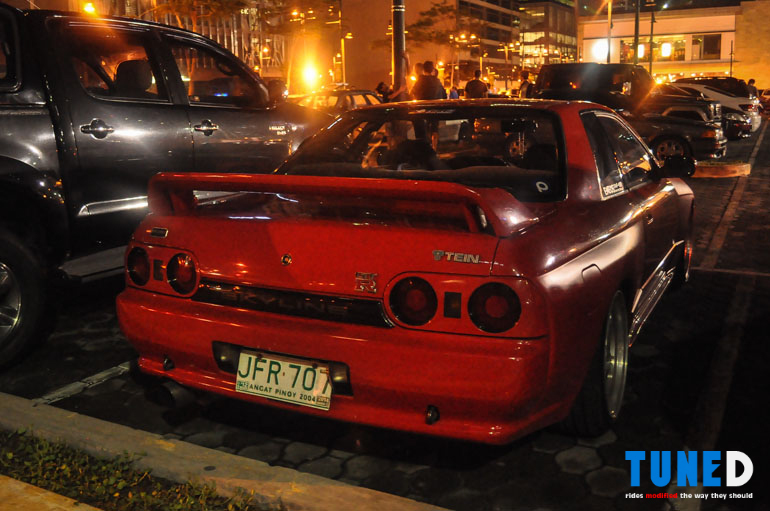 …Mainly thanks to the fellow that brought out this Acura NSX for the party! 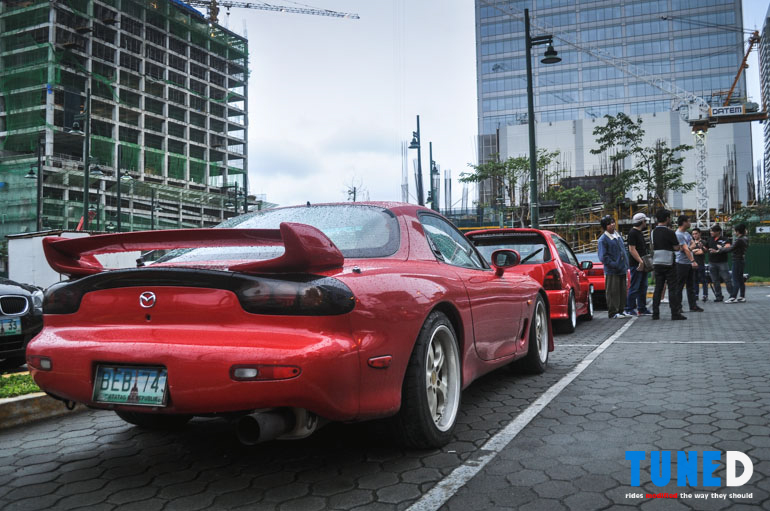 Expecting to bring his RX-7, I invited a friend of mine to join us for the event… only for him to bring out another beast entirely. 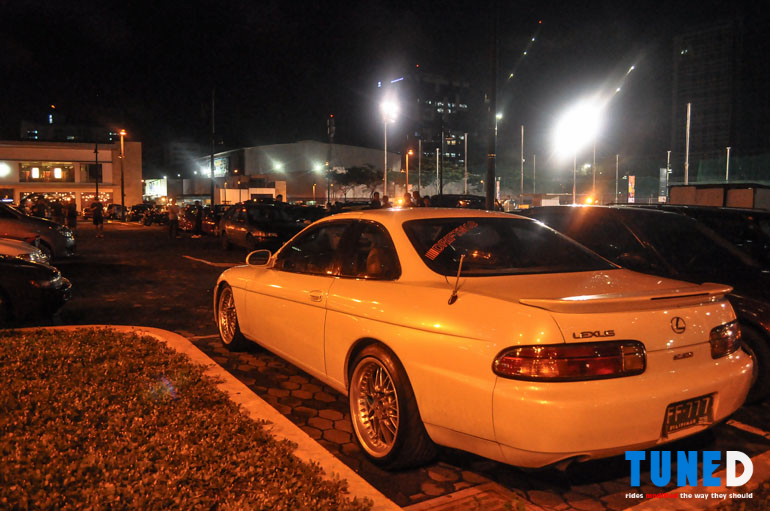 No complaints from anyone at all though, these cars are as good as unicorns the world over. 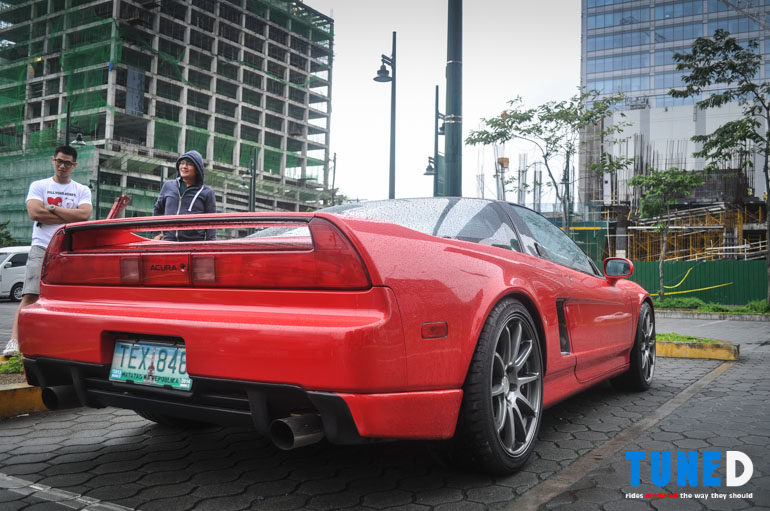 Despite lacking in horsepower compared to its Italian contemporaries during its heyday, the NSX has clearly cemented itself as the car that would age well and would become sought-after after all these years. No love for four-doors? We’ve got that covered too. 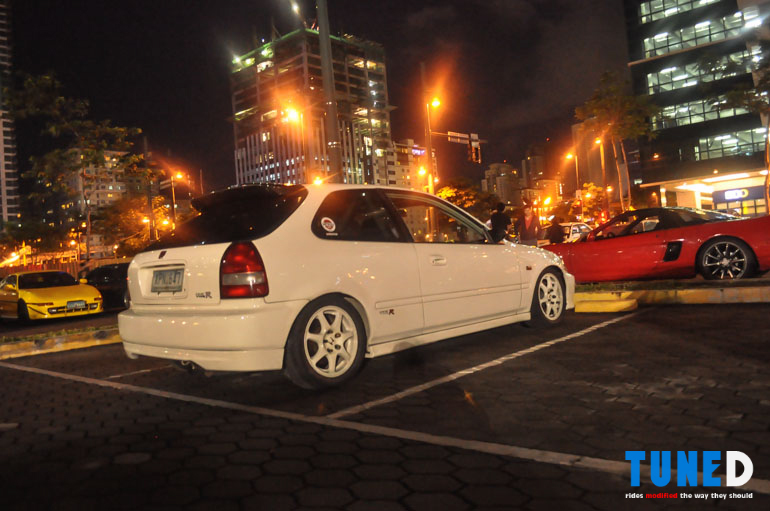 Who’d have thought a properly sorted Mazda 323 would show up to the meet? The 323 was a car that was hardly worth mentioning back when it first came out, yet it’s nice to see certain individuals sticking to their guns and making their cars that extra bit nicer. 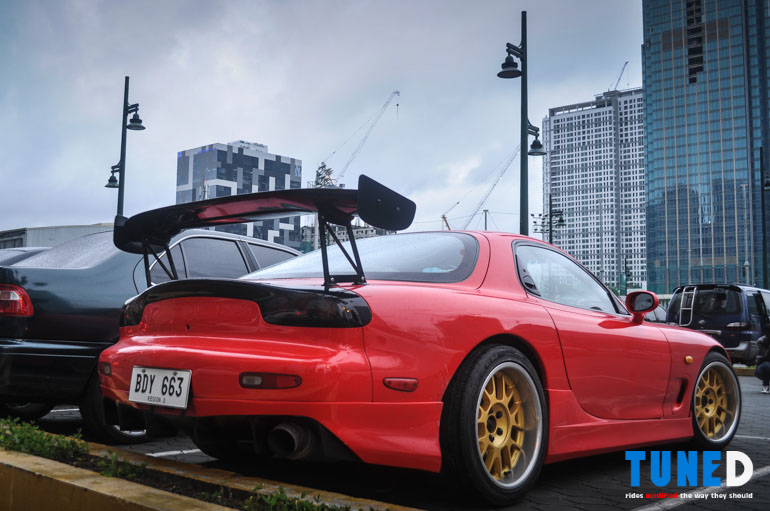 I had a nice chat with its owner too, and I was flattered that he’d recognize some of the rarer parts on my FD! 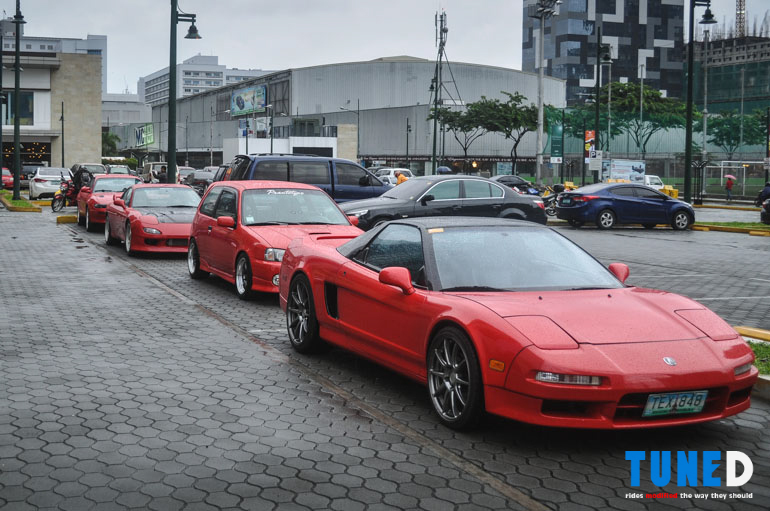 The Honda fanfare wouldn’t stop at the NSX because a handful of EK9 Type Rs actually made it to the meet. 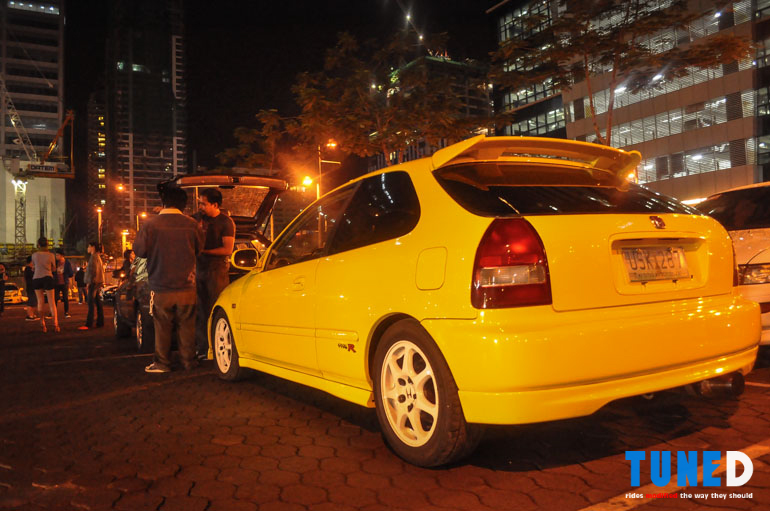 Whether it’s a stock example or a caged and gutted circuit-spec hatch, Type Rs were well-represented throughout the evening. Only proper to see a white Evo and a clean (read: non-drift battered) S13 Silvia for a change. 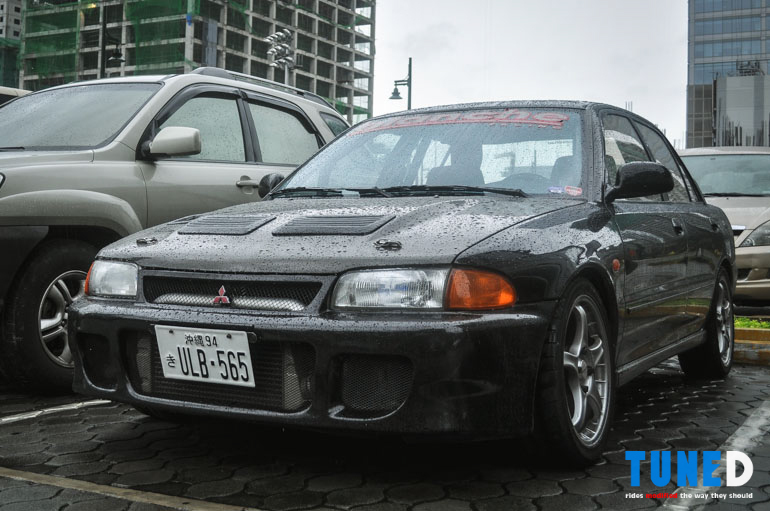 This Evo V is actually an RS model, a factory-gutted trim of the Evolution that would have been easily 70-100kg lighter than the standard GSR model. A tell-tale sign of this trim would be its lack of foglamps and blacked out door handles. 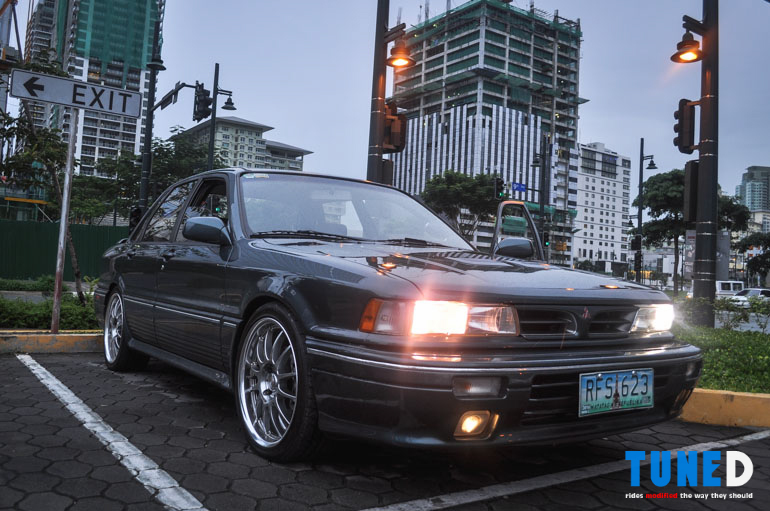 Yes, this is a genuine USDM Galant VR-4. 4-wheel drive, 4-wheel steering, 4G63T. 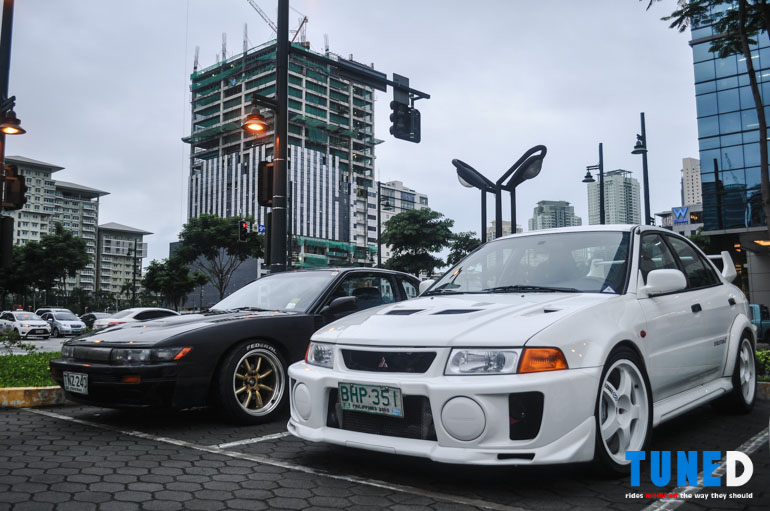 Pretty much considered the predecessor of the Lancer Evolution, the VR-4 was loaded with the technical wizardry we’d all become acquainted with in the Evo years later. I’m rather thankful that I’m not the only one not bringing pistons to the party! 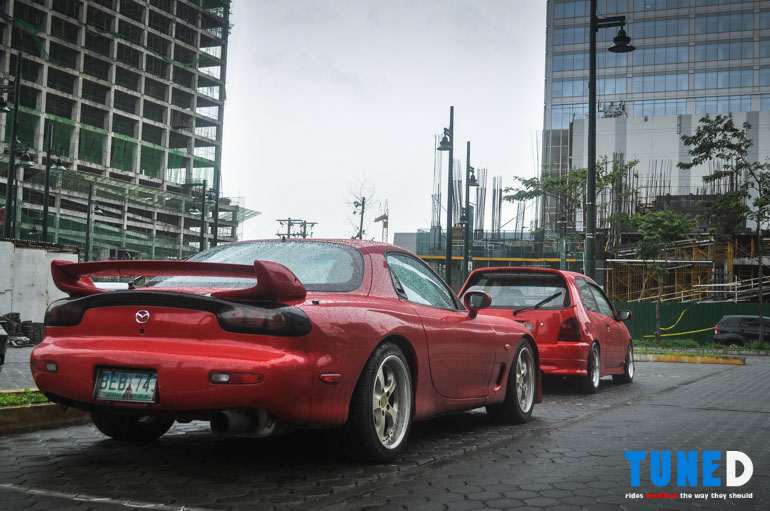 Fancy how the event actually ended up with three red RX-7s in attendance, as seeing even two at a time is already a miracle around our parts! 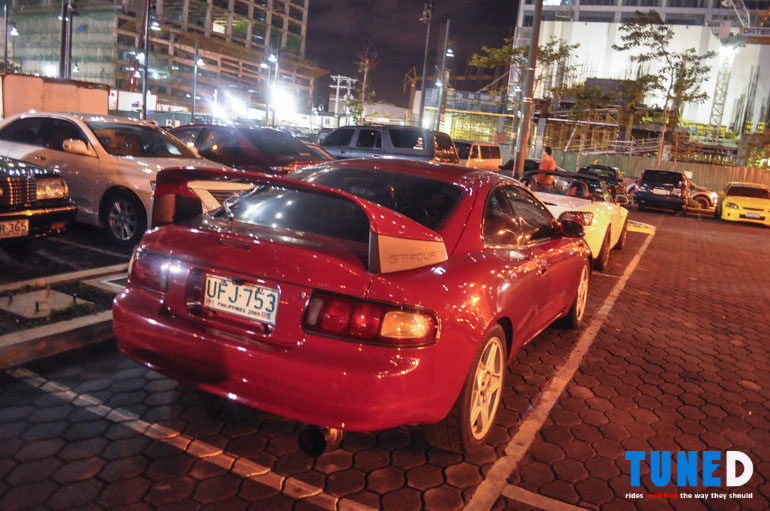 Oddly enough, only one MR-2 showed up. 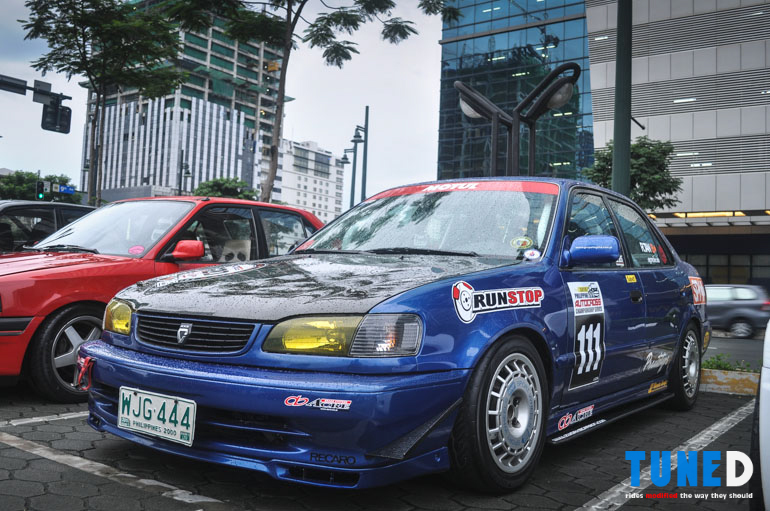 Nonetheless, it was well sorted with its aero bits and was more than enough to represent the midship party! Wagons were also in fair abundance at the meet, with some of them being put to good use! 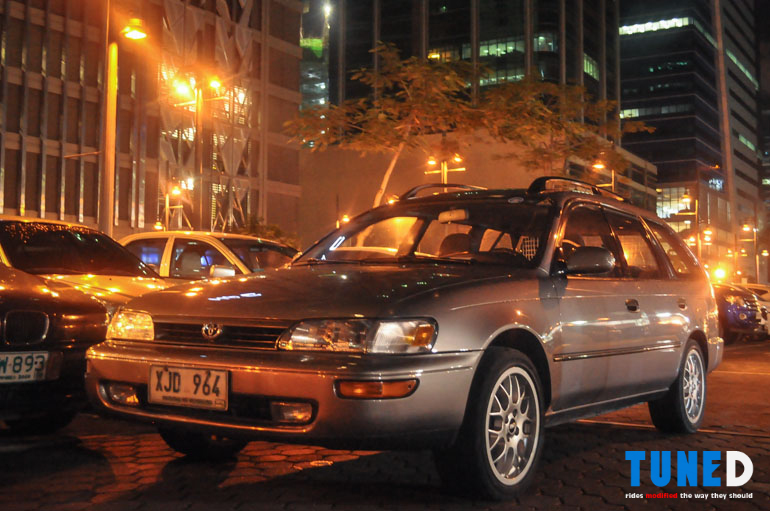 This Legacy’s owner used his wagon hatch to sell some period-correct snacks (think: Champola, Pee-wees, Chippys) and stickers to help fund the operation of a good friend of ours. Where you’d normally see a trunk, again we find a hatch! 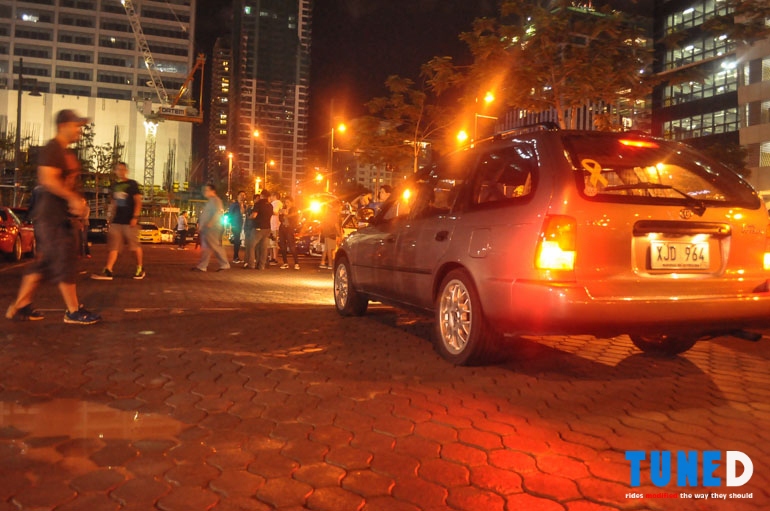 This AE102 Corolla Van was a welcome addition to the meet, suffice to say this car alone contributes much to the diversity of cars that evening! 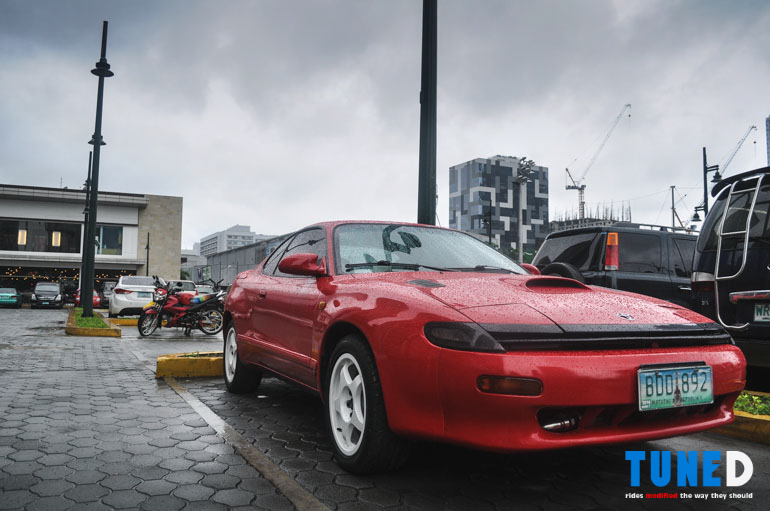 From unicorn sports cars to absurdly rare family shuttles, the 90’s had that right mix of ecclectic variety and technology that allowed for people to explore what was possible back then. The cars of that decade have clearly shown this, and now our generation of enthusiasts have the responsibility of carrying this torch to remind others to chase those cars they’ve seen on their games or on their bedroom walls. We hope to continue organizing meets like these regularly, and we hope everyone will look forward to them too!